If you’re going to be doing any serous entertaining in your back yard this summer, you’re going to want to crank some tunes. A portable outdoor bluetooth speaker system is exactly what you’ll need to get the party going and you don’t have to spend a fortune for a great sounding wireless speaker that also looks good and stands up to water and weather. I got my hands on a dozen of the best bluetooth speakers that are in the $200 range and below. I picked my favorite 5 speakers based on sound quality, ease of set up, quality of construction, ergonomics and style. You can definitely spend a lot more money on a portable speaker set up, but in my opinion there’s no need. There’s plenty of great units in this mid price range that will knock your socks off and have you enjoying hours of listening while you barbecue with friends and family or hang out by the pool. Check out the list below. Take a look at some of the product specs of the portable outdoor bluetooth speakers I reviewed. The first set of speakers I checked out were the Sound Appeal Bluetooth speaker. They are the largest of the bunch and comes in a pair of two. 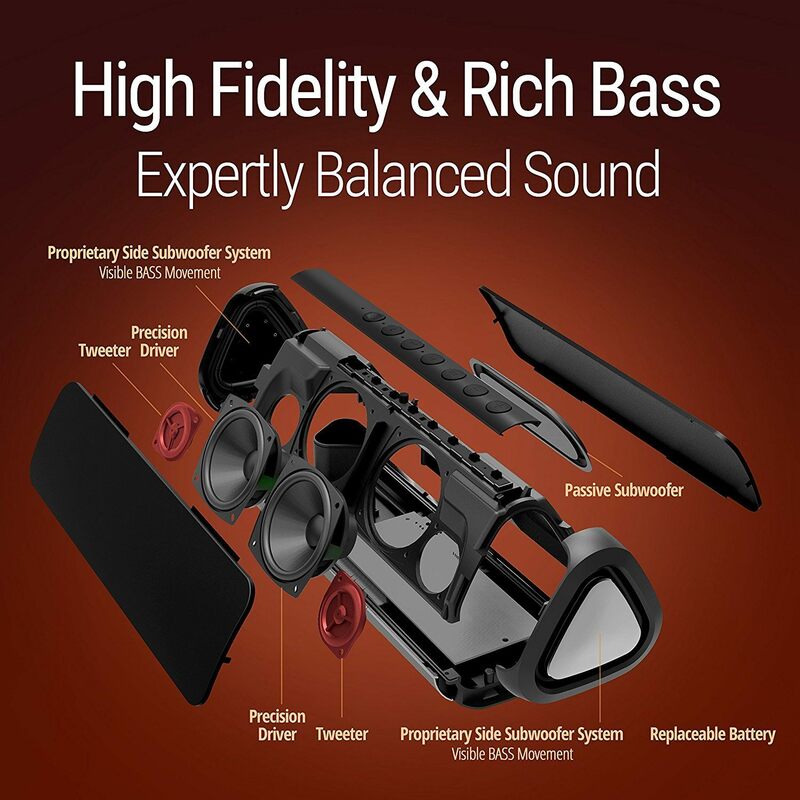 While it does offer a wireless Bluetooth option for playing music, the sheer size of the speakers requires that they use a corded power supply. Luckily, the power cord is 25 feet long, which is far longer than most people would need. The cord connecting each speaker is generous, too. These speakers are “weatherproof,” but nowhere does Sound Appeal describe them as fully or partially waterproof, so I would hesitate to leave them out uncovered in a storm. For light drizzles, wind and other weather, however, they stay put and experience no damage. That makes them perfect for a porch or other covered-outdoor-area situation. In terms of ease of use, you can’t get much easier than this. Simply plug them in and connect via Bluetooth. The sound is adequate for my needs, but on the other hand, they aren’t as loud as one would expect for speakers of this size. As for the quality of the sound, it’s well-balanced and clear. It’s great quality for the price. Now for the downsides. The Bluetooth connectivity can be a bit spotty with these speakers if the source roams too far away, even though the range is supposed to be 60 feet. In addition, the large size makes them not quite as convenient for those who want a versatile speaker — they’re better for mounting in one spot permanently. They’d probably work well for those with a large property or those who like to throw large parties often. If you decide to use them for that purpose, these are a good bargain. One recommendation is to plug them into a switched outlet rather than a standard one so that you’re able to turn the speakers on and off easily as needed. Reaching the volume switch could be a pain otherwise, especially if you mount them up high, which seems to be their intended use. I wanted to include a set of outdoor wireless speakers that were meant to be mounted under an eve or in a fixed position and not in a portable unit. These Sound Appeal speakers have excellent sound quality, are very simple to install and hook up to your bluetooth devices without any issue. Definitely consider these bluetooth speakers as an outdoor option for your patio or deck area. The price is very reasonable and you’ll be more than happy with the sound these produce. This portable Bluetooth speaker from Bose was my next test. It’s on the other end of the spectrum from the Sound Link speakers in that it’s super compact and completely wireless, designed for carrying around from place to place easily. This speaker has a couple extra perks that I think is crucial in a Bluetooth speaker, though there are trade-offs. Firstly, the speaker is built with a rechargeable battery that can be charged using a USB cord. It offers up to 8 hours of play time on one charge, which isn’t as much as some other brands though it’s still plenty enough for regular use. You can also play the speaker using USB power if the battery is running low. The Bluetooth connectivity on this speaker is great — it’s consistent and rarely, if ever, spotty. The range is supposed to be around 33 feet, and that seems to hold true in my backyard testing. Not only can you play music through Bluetooth, but you can also connect to digital voice assistants like Siri, Google or Alexa using the built-in mic on the Bose speaker. You can also use the speaker to make phone calls, although you may not want your phone call blasted across the room. Speaking of the sound, this speaker has impressively rich, full sound for such a small speaker. That’s not surprising, considering that it’s a Bose product, but it’s still a nice bonus for a small, unassuming portable speaker like this one. The volume is loud without sacrificing sound quality. One last perk of this speaker is that it’s water-resistant, so you can use it by the shower or pool without any problems. 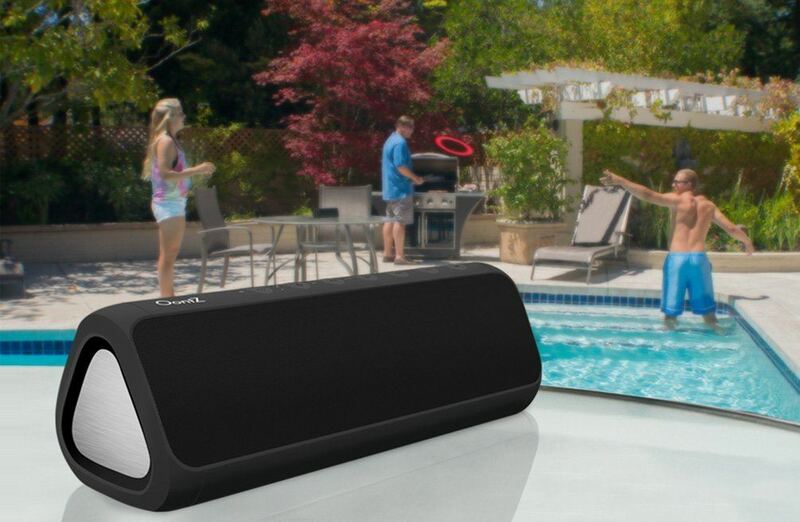 That’s a major plus in my mind, since bringing the speaker to the beach or pool is practically the whole point of buying an outdoor Bluetooth speaker! This speaker is easy to use for the technologically-proficient, though the controls might be a bit tricky for some. In addition, the 8-hour battery life is likely not enough for those who want a speaker that can play background music all day long. I love Bose speakers & audio gear. I’ve owned several Bose home speaker systems in the past and all of them were amazing. 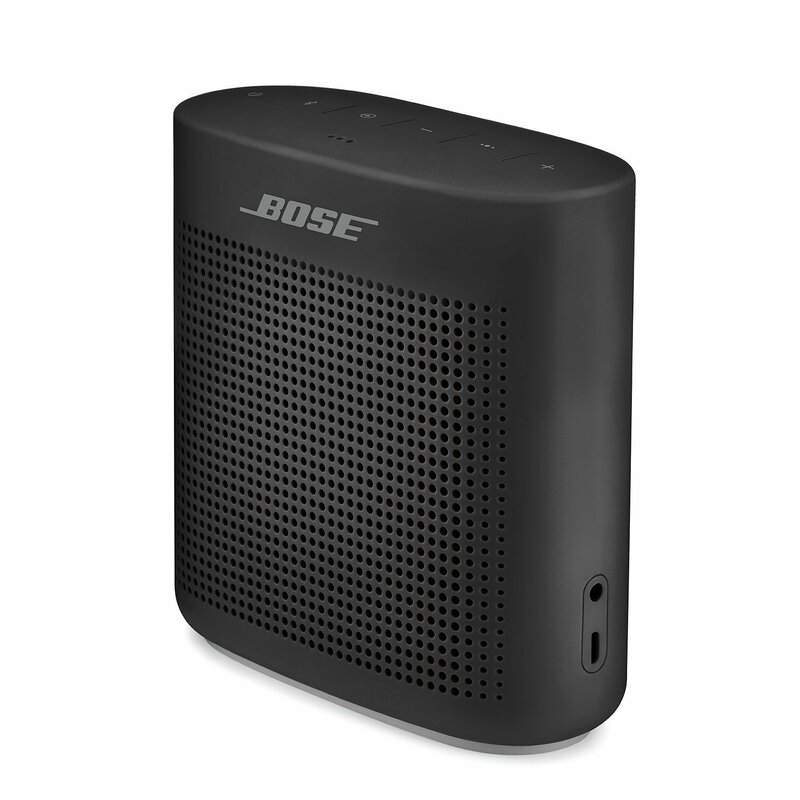 This little outdoor bluetooth speaker packs a whole lot of sound in a small package, which you’re used to with Bose. Great connectivity, high quality sound and a decent price tag. This is a cool little wireless speaker system that is sure to impress you as well. The MacroBoom was definitely designed for rugged, outdoor use. 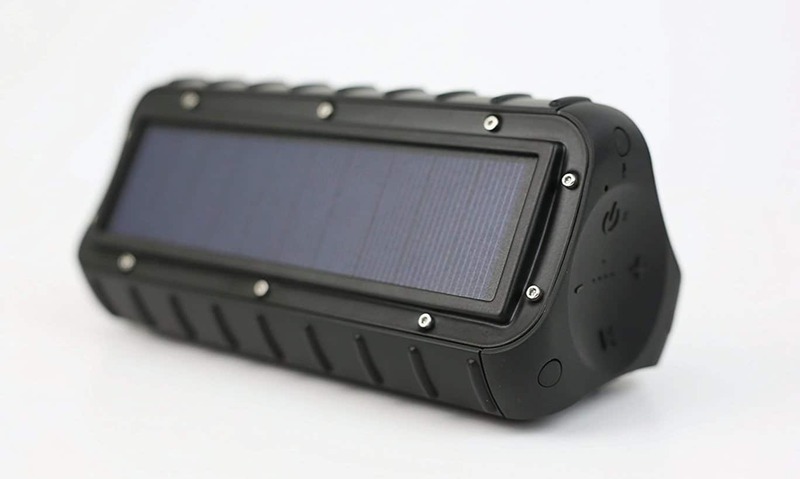 It’s completely waterproof, has a fairly long battery life of 15 hours, and is able to be charged using solar power in addition to a regular USB connection. That’s a pretty unique set of features, and this speaker would be ideal for a weekend camping trip or day hike. It even comes with an included tote bag and carabiner in the package, along with a mount for attaching it to your trail bike. Aside from these bonus features, this speaker is a good all-around performer. It has a built-in mic for taking phone calls. The generous battery life makes it easy to use without worrying about a dead speaker, though keep in mind that it’ll die sooner if you’re playing it at consistently high volume levels. It has slightly louder volume than you’d expect for a speaker of this size. The sound quality is good. 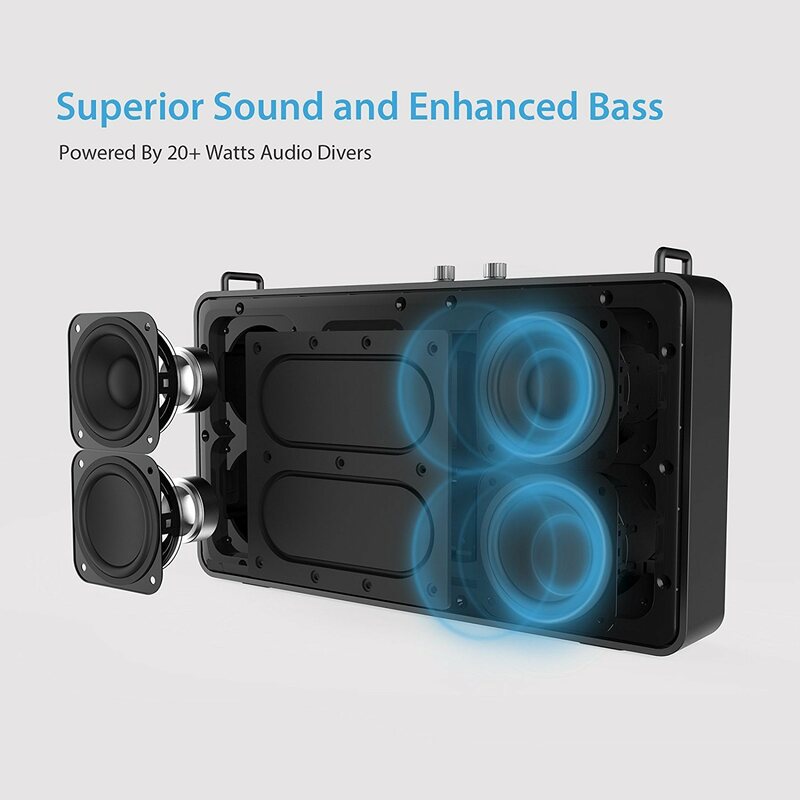 It’s clear throughout all volume levels and has plenty of bass. The Bluetooth connectivity is stable within range as well. If you plan to buy this for home use, you might buy a pair of two and connect them using the dual pairing feature. I didn’t happen to take this speaker camping, but I did try out the solar charging feature. It does work, but predictably is slower than charging with a USB — a lot slower. It barely charged at all over the course of a full day of sun. It’s probably more of a back-up option for when a regular power source is unavailable. 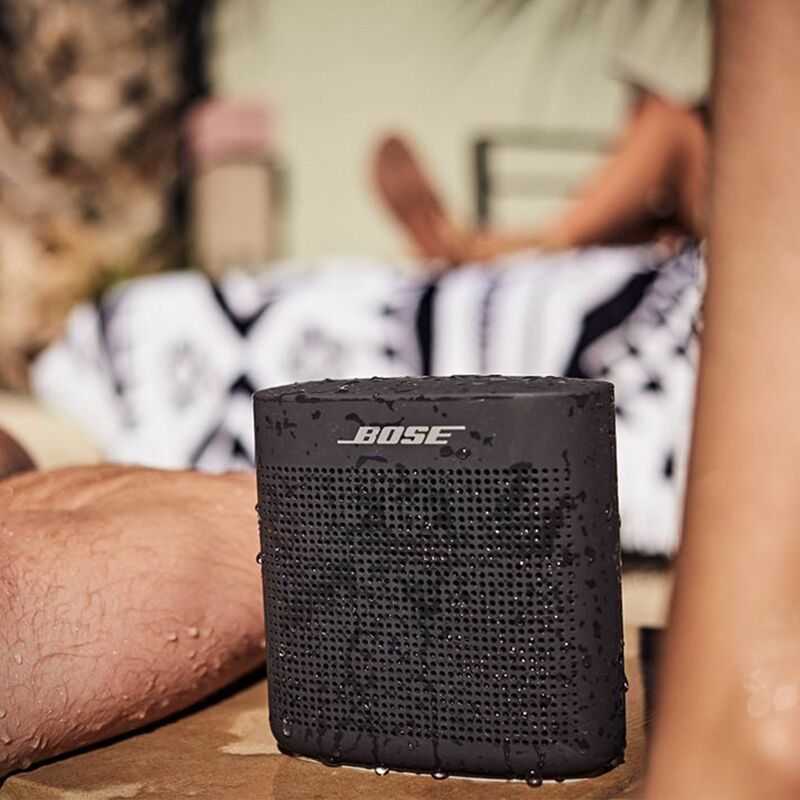 The speaker is waterproof for up to 30 minutes of submersion in shallow water, so it’s easy to take it by the pool or beach without worrying about the occasional dunk. It’d also work well as an outdoor shower speaker. The MacroBoom IP67 is one tough little bluetooth speaker system that has a TON of features. 15W output with 2x2.5″ Ti drivers cranks out the sound. Fully waterproof construction means this thing can literally go anywhere you go. The case is rugged and can take a beating. The only down side is the slow solar charging, but this bluetooth speaker performs great and is one of my favorites of the test. The GGMM E5 speaker is one of the more sleek looking speaker systems of the bunch. It comes in a shallow rectangular square shape with a detachable leather strap, so you can carry it around like a tote bag if need be. It’s an easily-portable medium size, not too big and not too small. This speaker offers about 15 hours of play time, depending on the volume. 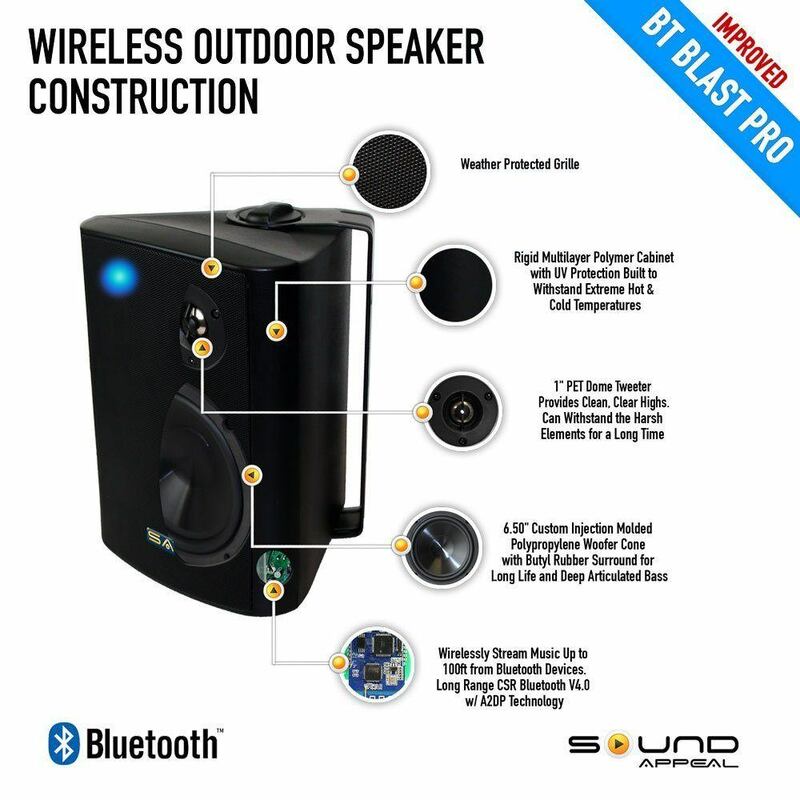 Unlike the other outdoor Bluetooth speakers on this list, the GGMM speaker offers Wi-Fi connectivity in addition to Bluetooth, which is convenient for saving on battery life. The Bluetooth connection is remarkably stable, while the Wi-Fi connection can introduce a slight lag at times depending on the quality of the internet connection. The sound quality is great considering the low price. One perk is that there are bass and treble knobs, so you can adjust the sound to your own liking. The volume is typical for the size — it gets loud enough for your average low-key pool party. 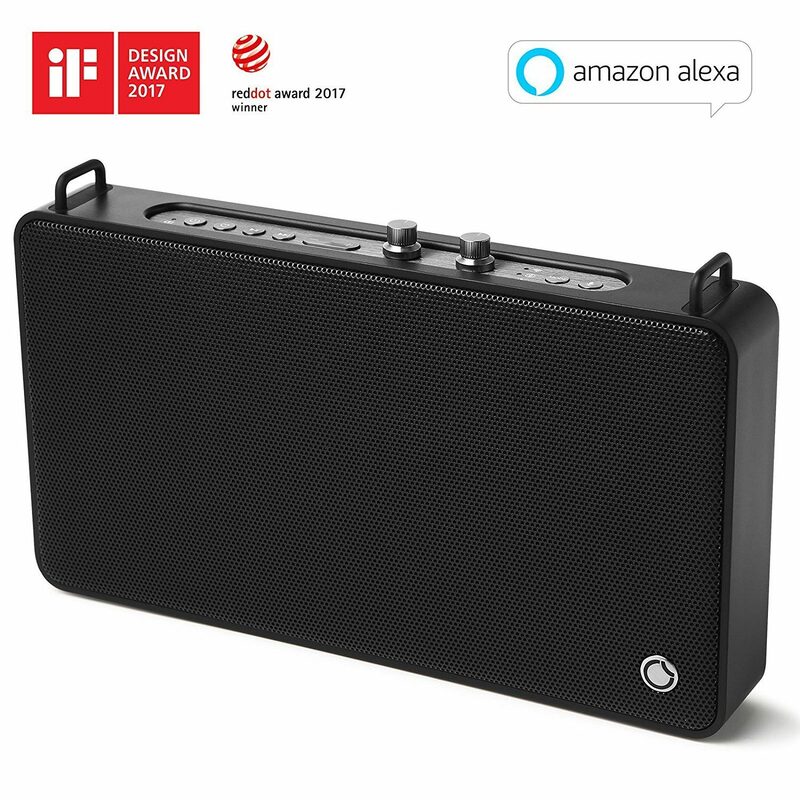 This speaker comes with a built-in mic as well as an app for connecting to Amazon’s voice assistant service, Alexa. Using assistants like Alexa is so convenient — you can adjust the volume or change the song without having to get up and go to your phone. However, the app itself is not the most smooth or modern-feeling, and you do have to have an Amazon account to be able to use Alexa. The other downside to this speaker is the lack of waterproofing or weatherproofing of any kind. I’d be nervous using it outdoors in an area where it may rain or fall into a body of water. But it’s totally portable, so you can bring it in when you’re not outside using it. The set-up for this speaker is easy and fast. Since it’s reasonably priced, it’d be a good option for buying multiple speakers and placing one in each room. The GGMM E5 is one of the best portable outdoor speakers on the market. It’s very sleek and clean looking with a beautiful matte finish and aluminum front grill. The fidelity is awesome from the 4x 5W driver and 2x subs, plus you can really crank the volume on this speaker without sacrificing sound quality. Other features like Alexa and a long battery life make this a top choice for great sounding, high quality wireless bluetooth speakers that won’t break the bank. My final pick from the wireless outdoor speakers that I tested is the Angle 3XL, one of the larger portable speakers offered by OontZ. As one of the most affordable options on the list (tied with the GGMM speaker), it’s certainly a good investment. 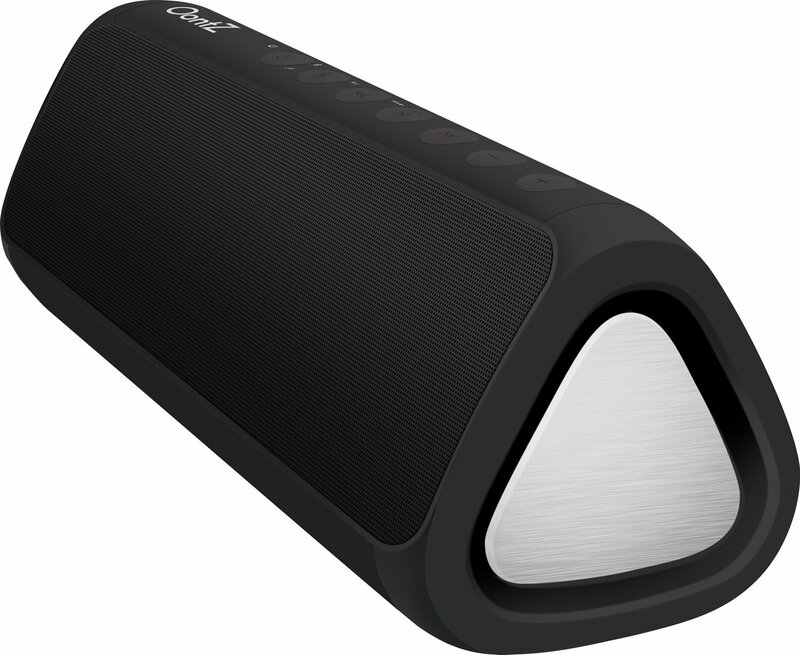 It’s lightweight for its size and has all of the standard features a portable speaker needs. The sound quality is good for a speaker at this price point, with plenty of clarity even at high volumes. With a built-in mic, this speaker can be used for phone calls or accessing voice assistants. It’s compatible with an Echo Dot. Importantly, it’s also water resistant, so it’s safe for pool- or any backyard entertaining scenarios. However, it can’t be submerged in water, as it’s not fully waterproof. That’s not ideal, but it’s not a huge con. This speaker offers around 8 hours of play time, though it may die in as few as 5 hours if you’re playing it at top volume. It can be played using a power cord, of course, but a longer battery life would be nice for a speaker like this. Where this speaker really stands out, though, is in the volume at 20 watts of power. 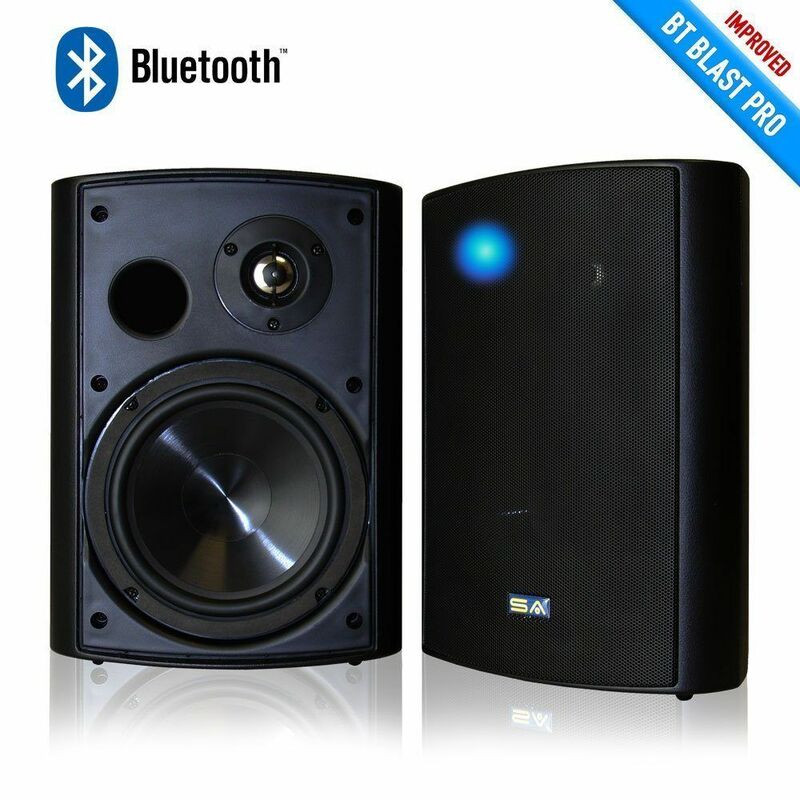 It has the capacity to get much louder than other speakers of similar size, and the difference is clearly noticeable. It would work perfectly for bringing to multiple outdoor events, since it’s easily portable yet packs a lot of sound into a small device. I absolutely love the OontZ Angle 3XL…maybe even more than the Bose. This speaker can blast out the tunes and it doesn’t distort or lose any of the sound quality. It’s easily the loudest wireless speaker I tested. It’s water resistant, which is a plus for outdoor use. Connects to devices with ease and maintains a strong signal. The triangle design looks cool and it’s a very portable speaker than can go just about anywhere. I definitely recommend the Angle 3XL for all of your backyard speaker needs. 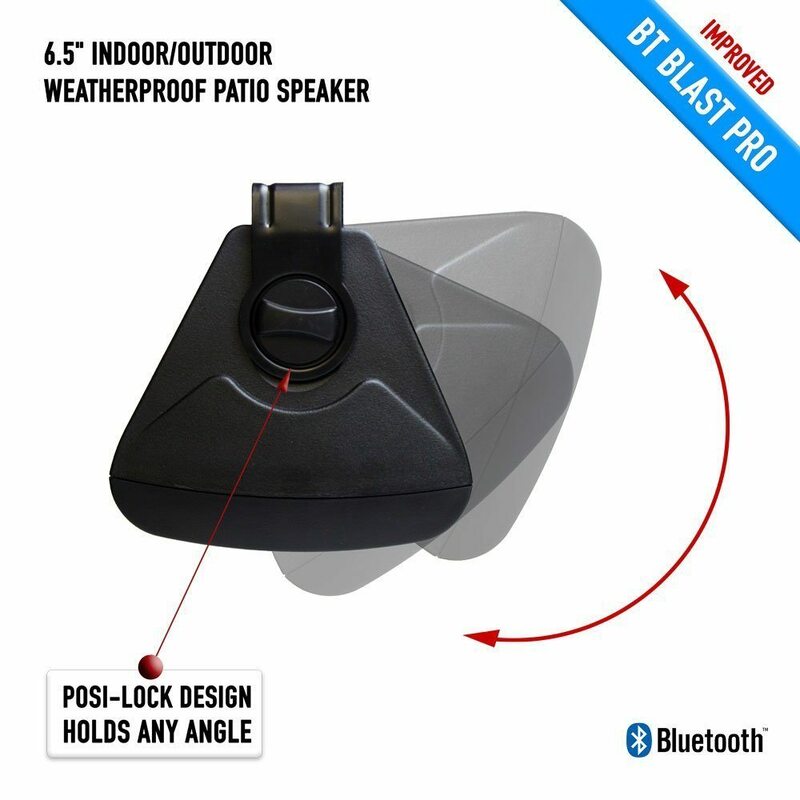 While a lot of the wireless bluetooth speakers on the market my look very similar there are some different features that you will want to consider when purchasing a speaker system for your outdoor space. Here is a short wireless speaker buyer guide to help get you pointed in the right direction. Since you’re probably going to be using your speaker system outdoors much of the time, you’ll want to get a unit that can perform well at higher volume levels if needed. This is especially important for parties and large gatherings where listeners may not be centrally located. For this, you’ll want to pay attention to the output watts for the speakers you’re considering. Any speaker with 20+ watts is going to have enough power to play at higher volume levels. However, keep in mind that this not only drains the battery faster, but not all speakers will sound as good at higher listening levels. Of the speakers I tested, the Oontz Angle at 20W output performed very well at louder levels. Make sure you get enough watts to handle any listening level you may need. While both bluetooth and wifi speakers connect without wires to their sound source, there are a few differences in the way they function that may be important to consider. Bluetooth speakers are generally battery powered, compact and very portable. The connection range is generally limited to about 30 feet, so you need your sound source relatively close by. A WiFi speaker connects to your home internet network connection and has a much greater range. You can also connect multiple speakers that can be located in different areas of your home or yard. Some wireless speakers have both bluetooth & WiFi capability, but make sure you get a unit that fits your particular needs. Outdoor speakers need to be tough and durable. If you’re going to be using them by a pool or body of water, it’s a good idea to consider getting a model that’s at the very least water resistant. 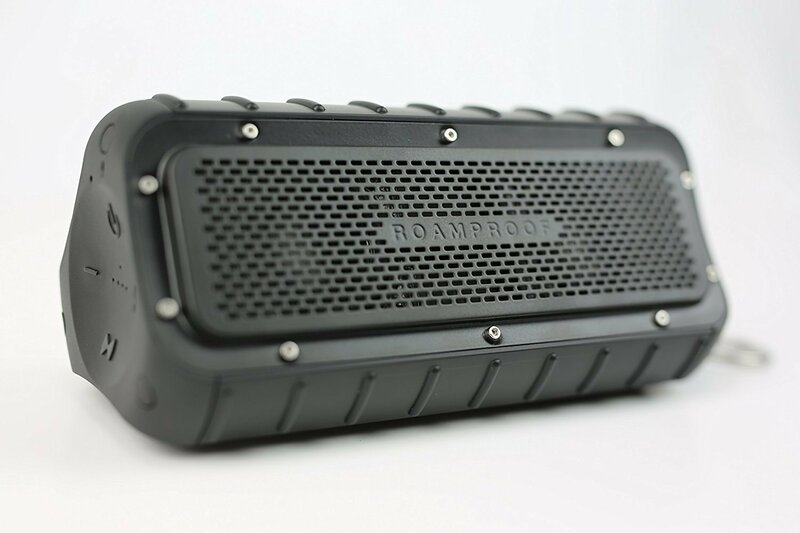 Some speakers like the MacroBoom IP67 are waterproof and can be submerged in shallow water without causing damage to the waterproof speaker system. Be sure to check the specs and ensure it’s listed as weatherproof or waterproof if you’re going to be using the system mainly outdoors. You’re going to find portable bluetooth speakers in all shapes, sizes and colors. It’s entirely your call which look you want to go with for your portable backyard speaker system. You can get slim units, boxes, tubes, triangles and even eggs & circles. The shape you pick will affect the sound and the portability of the unit. So keep that in mind before you buy. 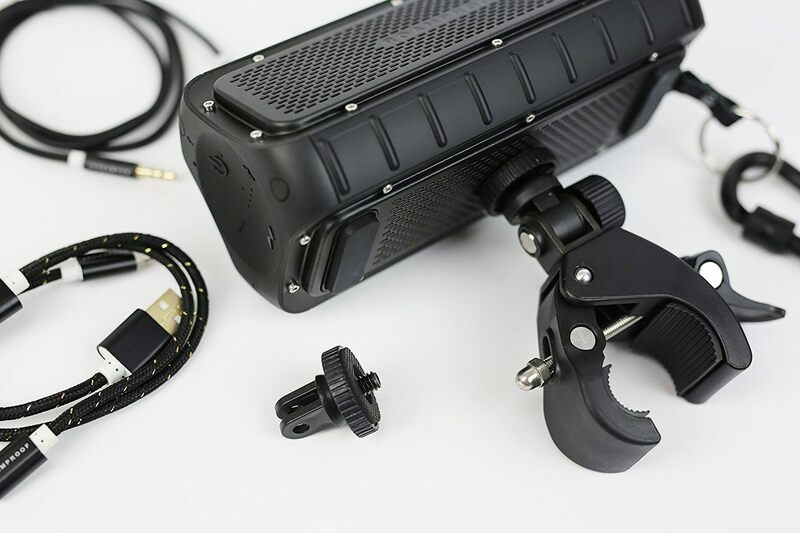 Nearly all speaker models will have aux inputs that will allow you to connect televisions, portable video & audio players. Some will also have USB ports so you can charge other devices or connect to other devices via a standard USB cable. As for outputs, if you want to add an additional speaker or sub-woofer to your bluetooth system, these outputs will allow you to do that with ease. 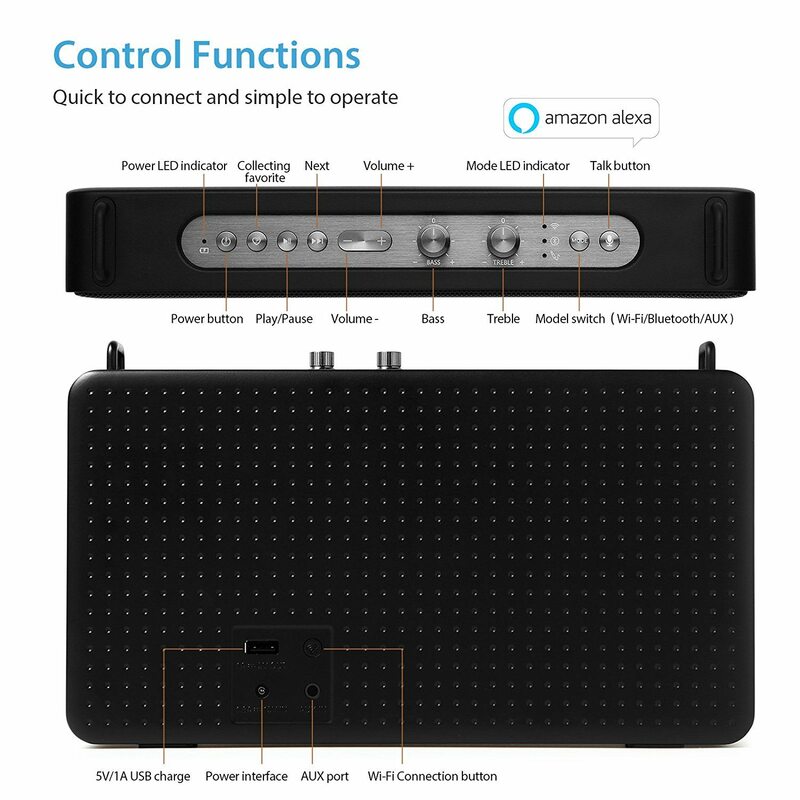 What is a good outdoor rated bluetooth speaker system which would be good for hiking & camping? Something that’s not too large, but durable and is easy to throw in a backpack? Any suggestions would be great. Hi Jillian. The Macroboom IP67 is absolutely perfect for what you’re describing. It’s definitely the most rugged of the bluetooth speakers we reviewed, yet it still cranks out the sound. You will definitely love having that speaker as part of your camping gear.